With cute looks and nice package, this nut speaker can be a perfect gift for the Birthday of your friends and families, or New Year, Valentine’s Day, Christmas, Thanksgiving Day. 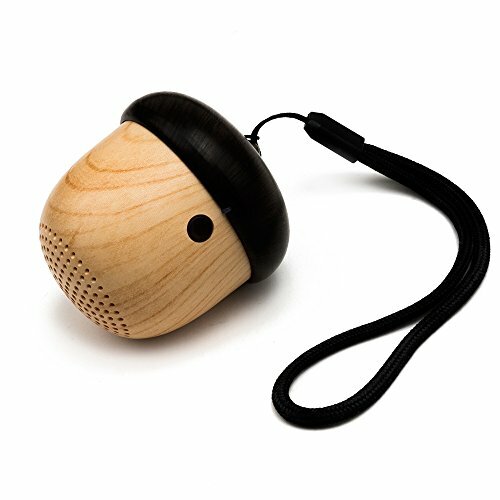 The Cute Wood-grain Nut Shape, smooth surface, elegant looks and natural beauty make this cute nut speaker a perfect item for decoration. With the Sling, you can hang it up wherever you like, your backpack, the kitchen, laundry room, outside or in the car, Oh, even the Christmas trees. Despite the small size, the sound is clear and strong, nice mix of bass (not big booming bass) and treble, the highs and mid-range are excellent. Compatible with iPhone, iPad, laptop, Android, MP3, MacBook, and other devices with Bluetooth capabilities.